A rock glacier is defined by Jackson (1997, p. 554) as "a mass of poorly sorted angular boulders and fine material, with interstitial ice a meter or so below the surface (ice-cemented) or containing a buried ice glacier (ice-cored). It occurs in high mountains in a permafrost area, and is derived from a cirque wall or other steep cliff." [Lliboutry (written commun., 1997) does not agree with this definition. He notes that old rock glaciers have no ice at depth; young ones may reach an elevation where permafrost is absent. The main characteristic is to appear like a mountain glacier and to show signs of flow.] A survey of the literature suggests that rock glaciers can be classified by genetic groups. Seven rock-glacier types are suggested that are created from four genetic groups (fig. 14A) (Giardino and others, 1987). A taxonomic classification of active rock glaciers is shown in figure 14B. In Argentina and Chile, the term rock glacier is used to describe a series of ice bodies covered with debris that are produced by different processes. 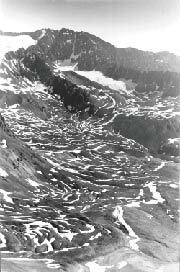 At one end of the series are the primary type of rock glaciers, those that are formed below snow- and debris-avalanche chutes (fig. 15). At the other end of the series are glaciers that have varying amounts of surface debris (fig. 12). Between these two extremes is a range of various morphological types of ice-and-debris bodies. However, both Louis Lliboutry and the author, following the concept of French morphologists concerning "pattern convergence," conclude that no matter what the origin of rock glaciers, they will tend to produce the same pattern if the climate, rock type, exposure, and cryogenic processes involved are similar (Lliboutry, 1956, 1961, 1965, 1986, 1990a, b). The main pattern consists of arched rolls (fig. 16). In the furrows, meltwater has washed down the silt, and squeezed clasts lie on the edge. In certain areas of the Dry Andes, where glaciers do not surge, glaciers covered by debris can contain up to four facies: (1) nondebris-covered ice, (2) thermokarst, (3) structural debris, and (4) inactive debris-covered ice. Some glaciers of the last type have been found to contain fossil ice that is a relict feature of a past colder climate during the Holocene (Corte, 1980). The different facies are present in different proportions on different glaciers. The Glaciar Sur del Tupungato is noted for a very large area of thermokarst features that is 9.3 km long and 900 m wide. Figure 12 illustrates the thermokarst facies of Glaciar Sur del Tupungato as seen from the air. Figure 14.--Classification of rock-glacier systems as suggested by A.E. Corte from Giardino and others (1987). A, Rock glacier systems, B, Taxonomic classification of active rock glaciers. Abbreviation: incl., including. 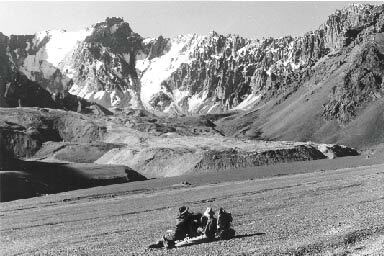 Figure 15.--Tres Dedos rock glacier in the Cerro Aconcagua group seen from the south. Photograph by A.E. Corte taken in 1977. Figure 16.--Rock glaciers at the head of Río Blanco (Provincia de Aconcagua, Chile) between about 4,600 m and 4,000 m. The upper part of Glaciar Olivares Alfa can be seen in the upper left-hand corner. Remnants of winter snow in the hollows enhance the arched rolls and pattern of flow. The general location of the Río Blanco area can be seen in figure 9 (north of number 12). Photograph by Louis Lliboutry taken on 28 January 1953. In other areas of the Dry Andes where surging glaciers are observed, it is possible to recognize some, like the Glaciar Grande del Nevado in the Río del Plomo basin, that reach old rock glaciers (Corte, 1976). Other glaciers that could be surging glaciers intercept (Glaciar del Tigre) or overtop (Glaciar del Plata) older rock glaciers. This is also visible in the Cerro Mercedario area (fig. 17). Under such conditions, the four glacier facies above are absent, isolated, or superimposed. 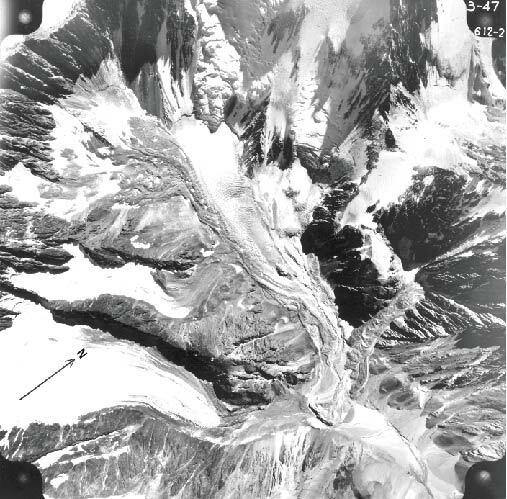 Figure 17.--Vertical aerial photograph of glaciers on the southeast side of Cerro Mercedario (6,700 m). Note the north arrow. In the upper middle, a hanging glacier flowing from Pico Polaco becomes a valley glacier and merges with a shorter glacier flowing from Cerro Mercedario (lat 32°S.). At their termini, Arroyo Colorado has its source, after which the creek forces its way across, along, or through rock glaciers and remnants of old surges. Toward the bottom right-hand corner of the photograph, a small, steep, debris-covered glacier ends in several small tongues that can be considered to be rock glaciers. They are superimposed on a broad lobe of drift that crosses the valley; it is probably an older rock glacier. At the bottom right-hand corner, shoulders of scree above the valley probably contain buried glacier ice. They may be called "buried avalanche glacierets," which will eventually evolve into true rock glaciers. The continental climate, intense frost shattering, and steep topography of the Central Andes combined with low precipitation (about 600 mm a-1) produce ideal conditions for the development of numerous rock glaciers of different types. In the central high Andes, the area around Cerro (Volcán)Tupungato and Cerro Aconcagua (6,550 m and 6,959 m, respectively; see fig. 2) is the region of the greatest development of both debris-covered and nondebris-covered glaciers in the Dry Andes. This region, within a 200-km radius centering on Cerro Aconcagua, includes the Cerro Mercedario (fig. 17), del Plata, and del Plomo regions. The inventory of glaciers in the Mendoza basin of the Central Andes shows that uncovered and debris-covered glaciers and rock glaciers have a similar areal extent (303 and 340 km2, respectively) (Corte and Espizúa, 1981) (fig. 18). Figure 18.-- Mendoza basin in Argentina west of Cerro Aconcagua (fig. 9) showing the location of glaciers, ice-cored moraines, rock glaciers, and thermokarst features. Numbers refer to a map prepared by L.E. Espizúa. Stream IJA11854 flows into Quebrada de los Horcones at the west foot of Aconcagua. Stream IJA1184 flows into Quebrada Matienzo along the border. In the more northerly part of the dry Desert Andes, around Nevado de Acay (lat 24°25'S. ), small rock glaciers exist that are related to avalanche activity. Such rock glaciers are produced by the accumulation of avalanche and debris material generated by summer storms (Igarzábal, 1981) and are located in cirques formed during glaciation in the Pleistocene Epoch. These rock glaciers are important sources of irrigation waters for the aboriginal Inca communities. Nevado de Famatina (lat 29°01'S.) farther to the south has similar conditions and might contain similar types of glaciers, but field data are unavailable for this region. In the most southerly part of the Dry Andes, a region that receives about 800 mm of precipitation annually, debris-covered glaciers exist but in a much smaller proportion than in the Cerro Aconcagua area. The inventory of the Río Atuel glaciers (Cobos, 1981) (see central part of fig. 10), representative of this area, listed 80 percent of the glaciers as nondebris-covered and 20 percent as debris-covered glaciers. Although not as common, debris-covered glaciers exist farther south in the Wet Andes. Glaciar Casa Pangue, on the west slope of Monte/Cerro Tronador (fig. 2), was found to have 50-cm-deep debris at elevations of 800-850 m (Sigfrido Rubulis, personal commun.). 4 Instituto Argentino de Nivología y Glaciología, CONICET, Casilla de Correo 330, Mendoza, Argentina.